When there is a sudden change in the weather to hot, maybe with some Santa Ana winds thrown into the mix, and especially when it is unusual for a certain time of the year, I often remark that it’s “ earthquake weather.” Meaning this weather is strange so it must portend something, like an earthquake. This has been discounted as myth but that doesn’t keep me from continuing to say it. As a native of California, and having lived in the state my whole life, I have experience with earthquakes. The latest earthquake in Napa has started me thinking about them again. 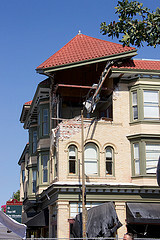 My first memory of earthquakes is when I was in elementary school in San Francisco. I was in class when it started. Our teacher tried to keep us calm. Then a large chunk of plaster fell from the ceiling and I ran out of the classroom door. Some kids from other classrooms had the same reaction and there was a group of us outside our rooms running for the main exit when the principal came out of her office and got us to stop. This helped me regain control and I quickly returned to my classroom feeling ashamed of my fear. Later that day, at home, we felt the aftershocks and my younger brother and I jumped up and down with each one until my mother told us to stop. I have been fortunate not to experience any major earthquakes. The last big one in Southern California was the Northridge quake in 1994. We were out-of-town on a ski trip to Lake Tahoe at the time. During that earthquake our front door blew open and a window in the front room shattered. Our neighbors came into our house thinking we were home and possibly injured. One of my brother-in-laws lives near us and came by to check our house and he boarded up the window. Glassware had tumbled out of the kitchen cupboards and he cleaned that up as well. When we came home from our trip, I noticed all the pictures on the walls were crooked like someone had broken into our house and turned them at odd angles. The medicine cabinet in our powder room had emptied into a nearby sink. The medicine bottles and assorted contents formed a small pyramid. There were a few cracks in our ceiling in some places and on an outside wall but nothing major. We were very lucky. To read more and hear a report about the Northridge quake done on the 20 year anniversary this past January click here. We did experience the aftershocks from the Northridge earthquake. You could hear them coming before they hit. A loud rumbling sound like a train approaching which you can imagine was pretty scary. We have had earthquakes occur in the middle of the night. When our kids were little and this happened, I would literally catapult out of my bed and hit the floor running toward their bedrooms to make sure they were all right and not frightened. If they were asleep I would stand in their doorways until the shaking stopped just watching them. Could this be the Big One? Is the house holding up? And then, finally, relief when the shaking ends with body and house still intact. After earthquakes there are calls and emails to check on other family members to see if they felt the quake and how they are doing. We check the news reports to see where the epicenter was, the damage and strength of the quake on the Richter Scale. Then, thankfully, it’s back to everyday things. This entry was posted in California, My Life, Nature and tagged California, earthquake, earthquake weather, Life, weather on August 27, 2014 by Deborah Drucker. Living here in Australia, so far from my family and friends, when I read or hear of earthquakes in California, I immediately head for my computer and start emailing. Sometimes, the news pinpoints the area and doesn’t simply refer to the general area, such as “In Los Angeles” or “Near San Francisco.” Thank goodness for Google, because I usually can find more specific-type reporting. Of course, in the Northern Hemisphere, if something unusual occurs ‘down under,’ often there’s a report of “In Australia,” even though the country is nearly as large as the entire U.S. A form of global myopia shared by quite a few locally-based reporters? I liked reading your blog, Deb, about your experiences and questions about earthquakes. As a kid growing up in Los Angeles (do I sound like a news report? ), I remember classroom drills and having to get under our desks, just as I also recall the earthquake in the middle of the night which toppled a jar of curry from my spice cabinet — thinking afterward of how very grateful I was that that was all that happened, while thinking, too, of “couldn’t it have been a jar of less pungent content.” Your skilful writing helps connect people, and I hope it’s bringing you a sense of well-being and knowledge of how it’s appreciated! Thanks Audrey. Appreciate your comment. I am glad your memories of earthquakes were not too bad. I am very happy if my writing is doing as you say.